The AccessPoint Key Cabinet Pro is a commercial quality, heavy duty key cabinet that features thick 16-gauge steel construction and a key locking door with a continuous piano hinge. Keys can either hang directly on the interior hooks or on the supplied numbered key tags with attached 5/8" split metal key rings. The key cabinet has four pre-drilled holes and comes with mounting hardware and key location chart. 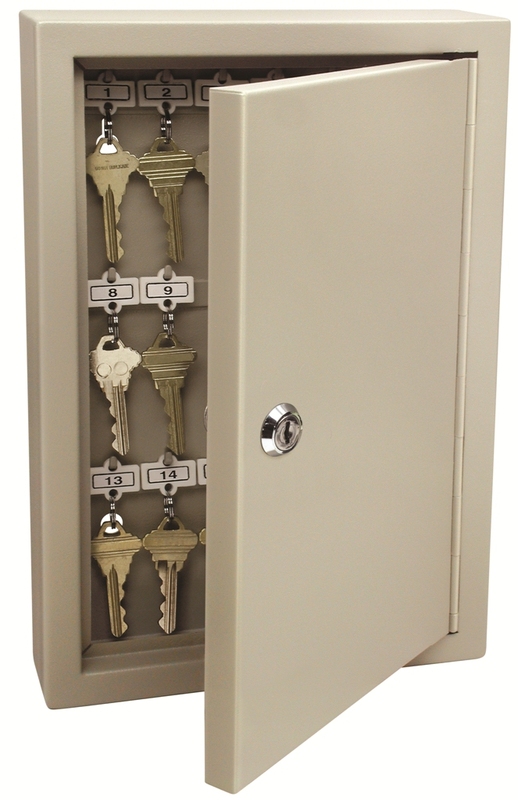 We can customize these cabinets by changing the lock to either a mechanical combination lock, with key override, from CompX or an electronic lock from Kitlock,shown below) In particular, the Kitlock KL1550 lets you require 2 people to enter their codes in order to open the key cabinet. Please call us at (831) 295-8460 for more information. Dimensions: 30 Key - 11-3/4" x 7-7/8" x 2-3/8"
60 Key - 19 1/4" x 13 3/8" x 4"
120 Key - 19 1/4" x 13 3/8" x 4" (hooks found on inside of door).